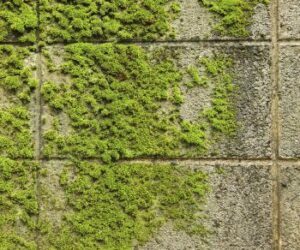 Get rid of moss with these tips! The humidity is coming back from hibernation, so that means moss might begin to grow in places that were clear before. Moss on bricks or other hardscaping features can be slippery and unsightly. So, you probably want to get rid of it if it has invaded your patio. Let’s check out some ways to get rid of that pesky moss. You might need a little chemical help. One popular way to get rid of moss is to put some bleach on it. If you have some household bleach and a little spray bottle, then you have all you need. Just spray a little onto the problem areas and wait for the moss to turn white. Then, simply scrape it off or use a pressure washer for removal. Now, this doesn’t work for everyone. Some moss is very stubborn and may require more intense chemical treatment. There are products available that kill moss specifically, so you can also try those. Now, make sure that pets, children, or any other living thing is not in the area while you’re spraying any of the products mentioned above. When you pressure wash the hardscape, make sure that you are wearing protective clothing because the bleach may splash up and irritate your skin. Just be careful out there! You can get rid of it manually, too. Now, moss doesn’t have any roots, so if you want, you can simply attack it with a stiff scrub brush. This might take some time and a little elbow grease to really do the job, but it is an option. Pressure washing the moss away can also work. You can find a pressure washer at your local hardware or gardening store. Make sure to call ahead and make sure they have one to buy or rent. If you want our help getting rid of moss, call the Atlantic Maintenance Group. The Atlantic Maintenance Group is a full service landscaping company, providing weed control, lawn fertilization, aeration, tree and shrub care, leaf removal, design and construction. To get your free quote today, give us a call at 410-768-4720 or contact us via our website today. You can also follow us on Facebook, Twitter, Pinterest, and Google+ to see how we’re growing! This entry was posted on Saturday, April 11th, 2015	at 7:14 pm	and is filed under Asphalt, Paver Patio	. You can follow any responses to this entry through the RSS 2.0	feed. Both comments and pings are currently closed.